Hip-Hop star, Meek Mill, releases a brand new visual off of his recently released Championships album, titled “Going Bad,” featuring Drake. 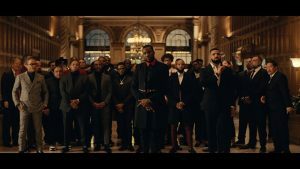 The new video sees Meek and Drake play chicken with their Rolls Royce Phantoms, ending in a head-on crash. Check the video, which features cameos from Nipsey Hussle, T.I. and more, below. Stay tuned!